The following essay appeared as part of a series, “The Joy of Reading and Writing” published by the LA Times. This essay is also printed in The Most Wonderful Books: Writers on Discovering the Pleasures of Reading and various anthologies including 50 Essays edited by Samuel Cohen. ← It’s Summer Solstice! Welcome Summer 2010! This is an interesting short article by an author whom many of us enjoy, Sherman Alexi. 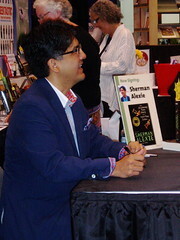 Count on Sherman Alexie to make discussing composing paragraphs entertaining!